Our German-style sawframes offer terrific value while maintaining our high quality standards. Made of high carbon steel all features are precisely the same as our German Deluxe models. 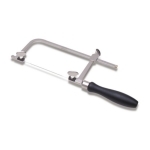 Each frame also features hardwood handles serrated lugs to tightly hold blades large thumbscrews and excellent alignment for straight and accurate cutting.